Two summers ago I traveled to Boston, Massachusetts and spent over a week exploring the city. I went by myself and just let my heart wander where it may. The city is so rich with history, that I fell instantly in love and didn’t want to leave! 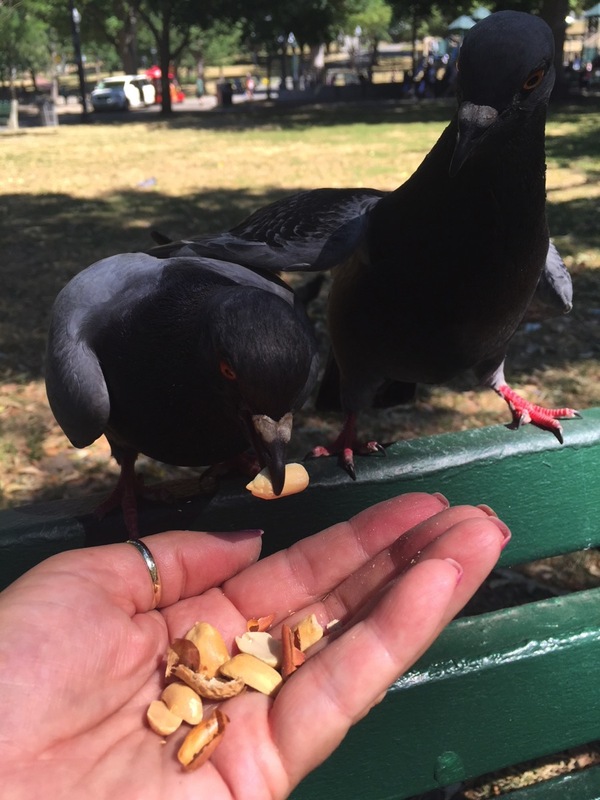 I spent my mornings in the Common, which is a huge park in the middle of town that has been there since Boston’s founding, feeding the pigeons and squirrels right out of my hands. I explored the historic cemeteries; standing in the same buildings that our founding fathers stood as they set the groundwork for this great country. I let my hands run along the same banister as Paul Revere and his children did so many years ago. I placed an armful of pink roses on Samuel Adams grave. For a girl that is very patriotic and loves American History, the trip was magical. One of the amazing things about Boston is the food. It’s right there on the ocean and it’s easy to get fresh fish any time of the day. I enjoyed oysters, shrimp, lobster, and a white fish whose name I can’t recall. It may have been Cod, but I am not certain. I do know that it was a veritable party in my mouth for the entire trip. 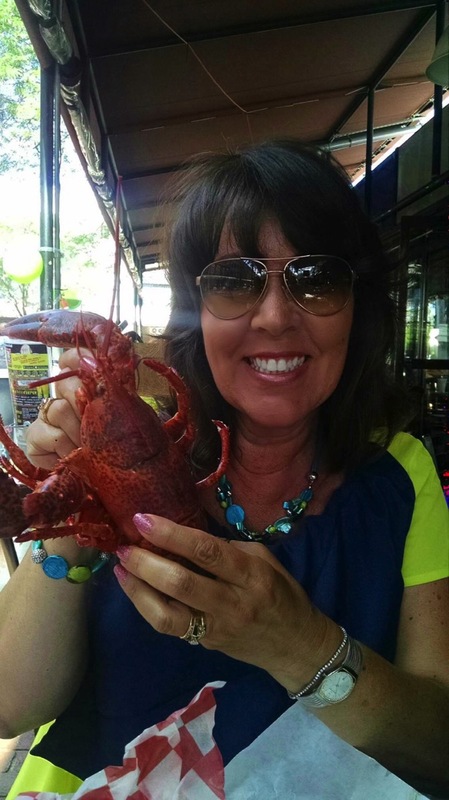 Me and my lobster smiling for the camera. One morning I went to breakfast and had an omelet with a side of Maryland Crab Cakes. Needless to say, I didn’t finish the omelet because I was mesmerized by the taste of those wonderful crab cakes! Where had they been all my life? I complimented the chef profusely and he was gracious enough to share the ingredients with me. The proportions I had to figure out myself, and after two years of experimenting, I have finally perfected the recipe enough to share it with all of you! 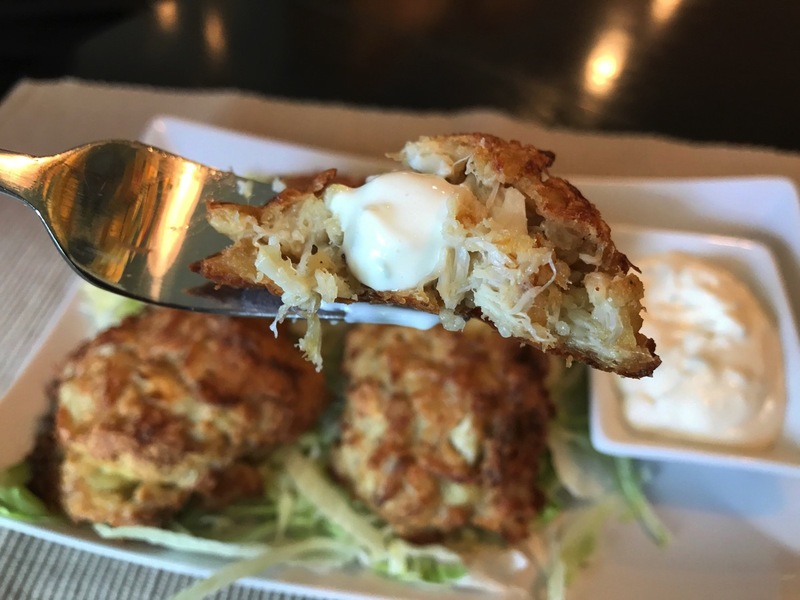 One thing you will notice about these crab cakes is that they are not fried in a skillet or deep fried. Although it takes a little longer, they are baked. This means that the wonderful flavors of the crab are not clouded by the oil used to cook them…and that makes them healthier as well! 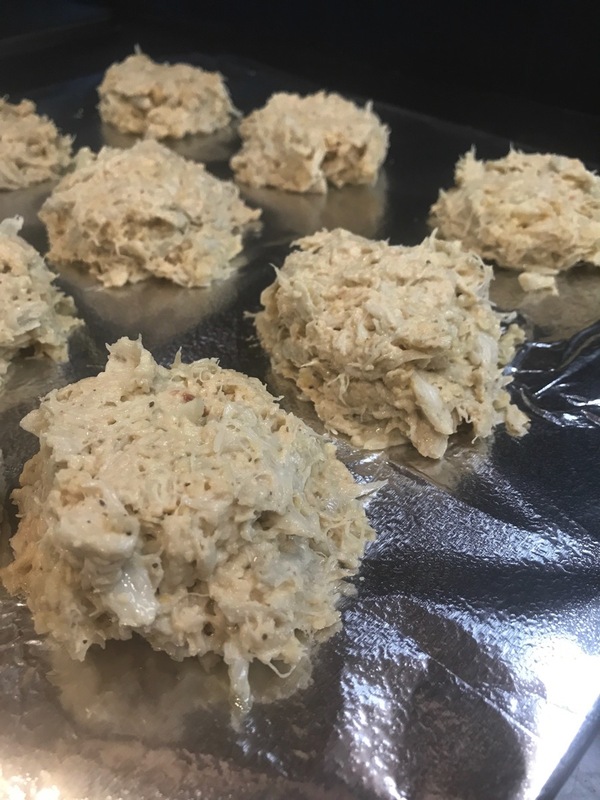 This recipe is very easy and the crab cakes themselves whip up in one bowl. 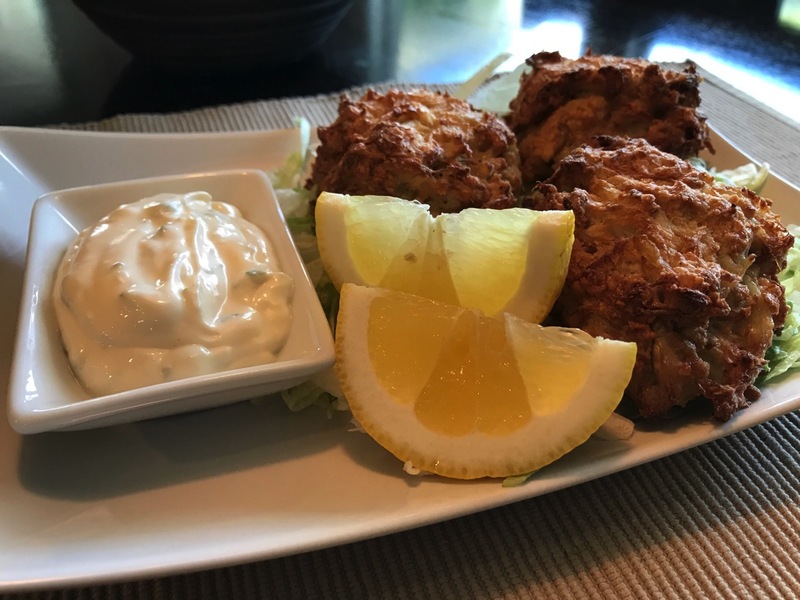 I have included a delicate lemon garlic aioli to serve with them, and I promise you will love them! 1. In a large bowl, put mustard powder, Dijon mustard, mayonnaise, eggs, Worcestershire sauce, Old Bay Seasoning, Tabasco Sauce (Tabasco is optional) and blend with a spatula. 2. Add the crab and crackers, and fold in with a spatula. 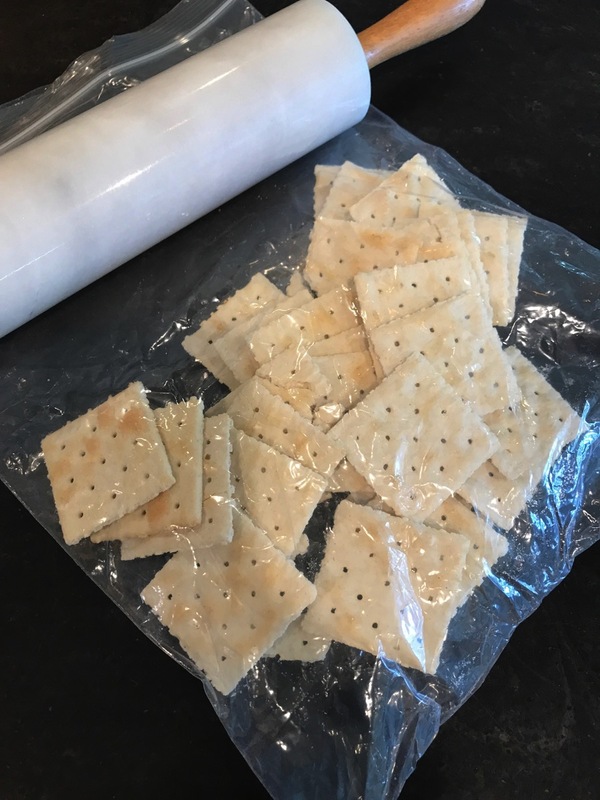 ***quick tip–put crackers in a large ziplock bag, squeeze out the air, and roll with a rolling pin to get no-mess cracker crumbs. 3. Cover the bowl with foil or plastic wrap and chill for one hour in the refrigerator. 4. Line a cookie sheet with foil and spray with non-stick cooking spray. 5. 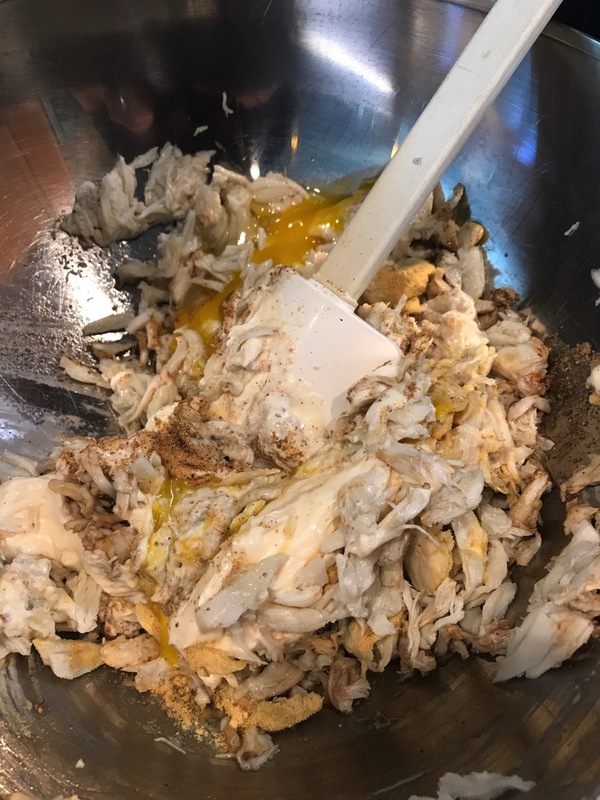 Using a large spoon, divide the chilled crab mixture into 10-12 portions. Gently press down with the spoon to make a thick patty. You may have to shape the sides a little as you go. 6. Bake at 400 degrees for 25-30 minutes or until patties are golden brown. 7. Serve on a bed of shredded lettuce with a small dish of lemon garlic aioli. 1. In a medium bowl, put mayonnaise, lemon peel, lemon juice, and the finely minced onion. 2. 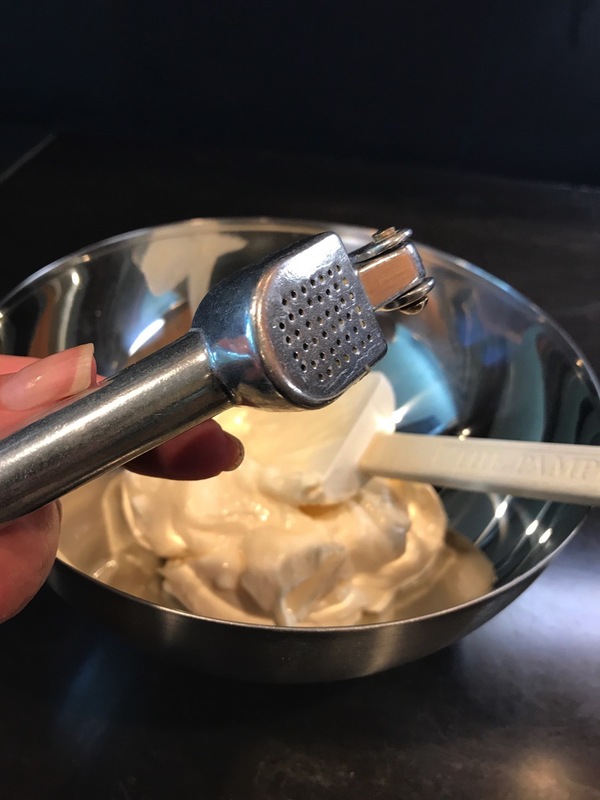 Press the garlic cloves through a garlic press to get a garlic paste. 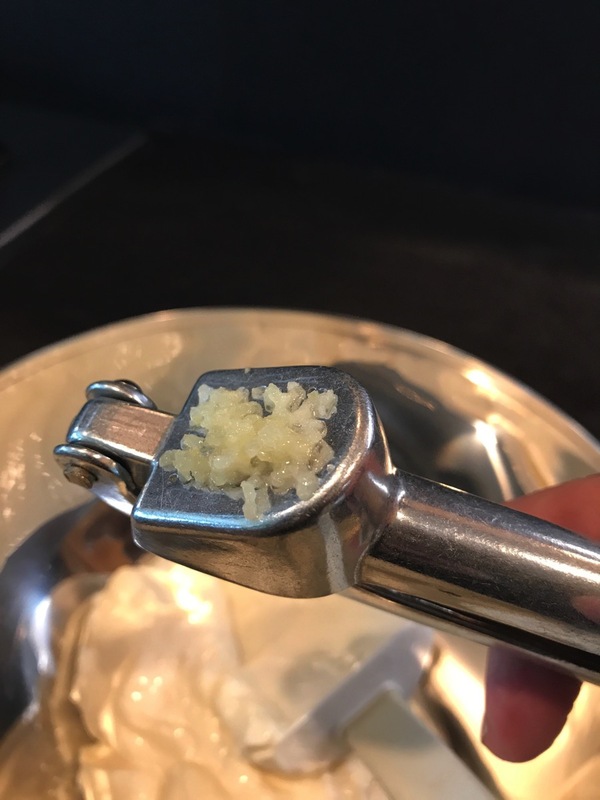 When you use the press, after pressing the garlic clove through once, reposition the garlic pulp and press again. Remove the pulp and discard, and scrap the paste from the front of the garlic press. Repeat for each garlic clove. Add to the other ingredients. Where to get fresh Crabmeat? I know you are seriously going to love these. I purchase lump crab meat at Costco, and it is a perfect portion for this dish. 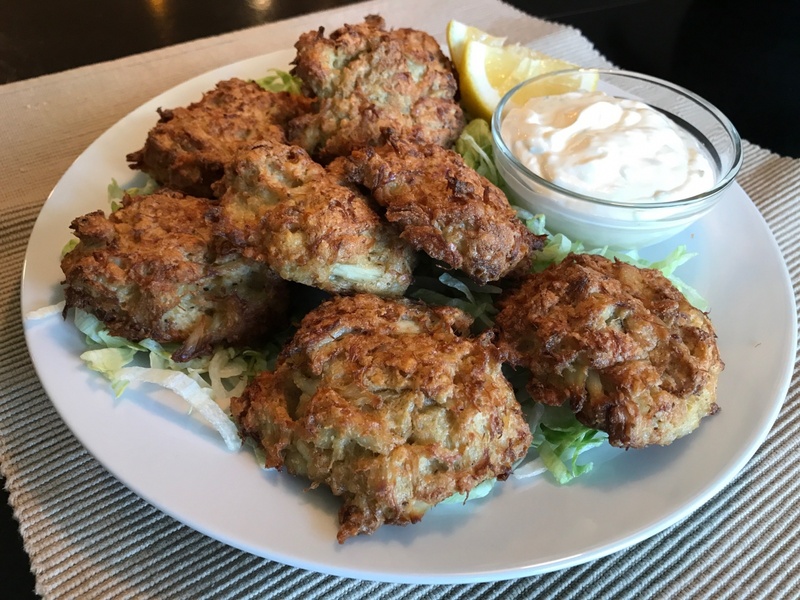 This recipe makes 10-12 small crab cakes or 5-6 larger ones. They can be eaten as an appetizer, a main course, or for breakfast. No matter when you eat it, it is always delicious! If you are looking for other recipes in our collection, check out my Citrus Bars or Prison Bread. David comments: For this recipe as it was so special I selected one of our favorite Chardonnays. This versatile varietal seemed to be a great option for pairing with this delicious crab cake recipe. What better excuse could there be for opening a bottle of the Smith-Madrone Chardonnay? The wine is a wonderful example that with good quality fruit and winemaking craft, oak can add an extra dimension to the grape when partnered with acidity to make a beautifully balanced wine. 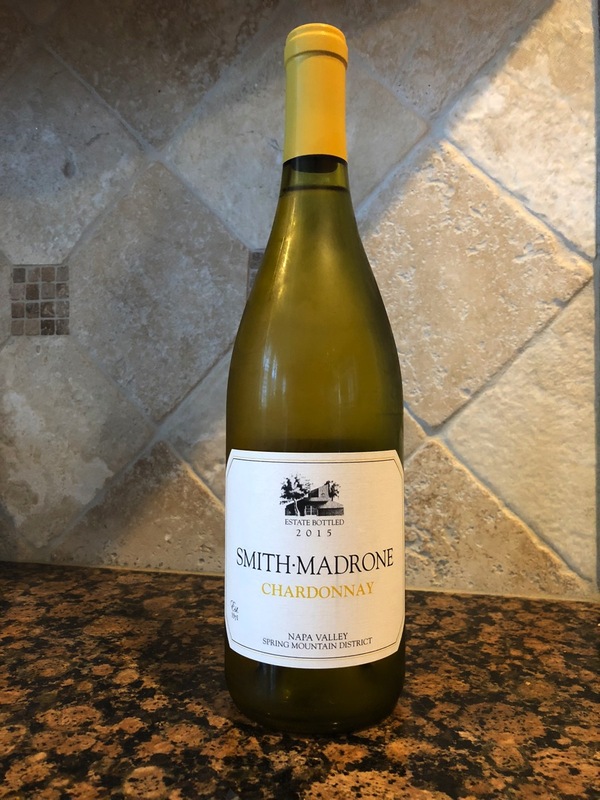 At $40, Smith-Madrone Chardonnay is a luxury wine at an affordable price. The crab cakes sound delicious – paired with a great wine. Michelle, thank you! They really are delish—I hope you make them! The aioli really makes them perfect! And they are so easy! Sounds great – we have no shortage of fresh crab on this coast in England, but we have never heard of saltine crackers! Can the Brit suggest an alternative perhaps? Cream Crackers or Water Biscuits do the same job. Thanks, Ellie for commenting! Thanks, Amber. We’ll definitely have a go at this.